The Draper Utah Temple is the 129th temple of The Church of Jesus Christ of Latter-day Saints. On October 2, 2004, the First Presidency of the Mormon Church announced plans to build a temple in Draper, Utah. The Draper temple is the third Mormon temple in the Salt Lake Valley and the twelfth temple in Utah. Another temple, the Oquirrh (pronounced 'O-ker') Mountain Utah Temple, is also about to be constructed in the Salt Lake Valley overlooking Bangerter Highway in the Daybreak development. 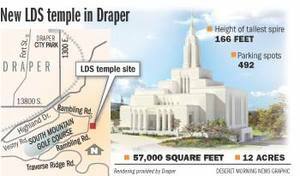 The site for the Draper temple is 2000 East 14000 South (address: 14065 Canyon Vista Lane, Draper) and is 12 acres. The temple site also includes a meetinghouse. The Draper planning commission approved the plans for the temple on May 18, 2006. The new temple is 57,000 square feet and 166 feet tall. The design is similar to the Idaho Falls Idaho Temple, with white walls (Temple White Granite from China), a central spire and a stair step design. Included in the construction is a parking lot that can hold 492 cars. Like many Mormon temples the temple site is on a hill. The window-art glass in the temple was designed by Utah artist Tom Holdman of Highland. Holdman has now provided stained-glass art for 14 LDS temples, as well as the LDS Conference Center in downtown Salt Lake City. The stained-glass art for this temple is reminiscent of log cabins and quilt designs, with an arts and crafts influence. The Draper temple has 700 decorative windows made of more than 30,000 individual pieces of glass. The glasswork took over 2 1/2 years to put together. Ordinance room murals were designed by Utah artist Linda Curley and Colorado artist Keith Bond. The Draper temple employs the sego lily (Utah's edible state flower) as a common motif in the decor. Makore wood from central Africa was used in the doors, trim, paneling, and cabinets. The limestone used in the flooring and base was imported from Lyons, France. On August 5, 2006, then President of the Mormon Church, Gordon B. Hinckley, presided over a groundbreaking ceremony and site dedication. At the ceremony President Hinckley commented that it was the faithfulness of the members in attending the temple that made the need for another temple in the Utah area. In 2004 the Church recorded more than 32 million temple ceremonies performed by Church members, and temple attendance has been increasing, especially since many members now have access to temples that are much closer. This is due to President Hinckley's zeal to build temples throughout the world. In the years that President Gordon B. Hinckley presided over the Church, more than 70 temples were been built. At the groundbreaking ceremony President Hinckley stated, "We must build temples where people can get to them, the Church is now worldwide which means that temples must be built all over the world. Fortunately, because of the faithful, tithe-paying Saints, we have the means to do so." The First Presidency, consisting of Prophet and President Thomas S. Monson, First Counselor Henry B. Eyring, and Second Counselor Dieter F. Uchtdorf announced the open house and dedication dates for the Draper Utah Temple. PUBLIC OPEN HOUSE Thursday, January 15 to Saturday, March 14, 2009 (excluding Sundays). Nearly 685,000 people toured the temple during the open house. DEDICATION Friday, March 20 to Sunday, March 22, 2009 (in 12 sessions) The twelfth dedicatory session, presided over by President Monson, was broadcast via closed circuit television to stake centers all over Utah. Recommends citing temple worthiness were necessary for all those who attended, since the stake center halls then became an extension of the temple. TEMPLE OPENING Monday, March 23, 2009. This page was last edited on 24 January 2012, at 11:26.